The three Japanese automakers agreed on key details regarding a new joint support project for the development of hydrogen fueling station infrastructure in Japan. The companies pledged up to $90,000 per station to cover construction and operating costs. Honda, Nissan and Toyota have already released, or plan to release, hydrogen fuel cell vehicles (FCVs) in the next year. FCV's use compressed hydrogen gas, that when combined with oxygen and drawn through an electrolyte, create electricity. The electricity is used to power an electric motor. The only exhaust is water vapor. Currently, there are only 23 hydrogen-fueling stations in Japan, but hundreds of more are planned. There are also considerable efforts in the U.S. and elsewhere to create more hydrogen fueling stations. In California, for example, 28 FCV stations are expected to be built by the end of 2016, bringing the state's total to 48. Additionally, Toyota has partnered with FirstElement Fuel to build refueling stations in California and with hydrogen fuel provider Air Liquide to build a network of 12 stations throughout Connecticut, Massachusetts, New Jersey, New York and Rhode Island this year. 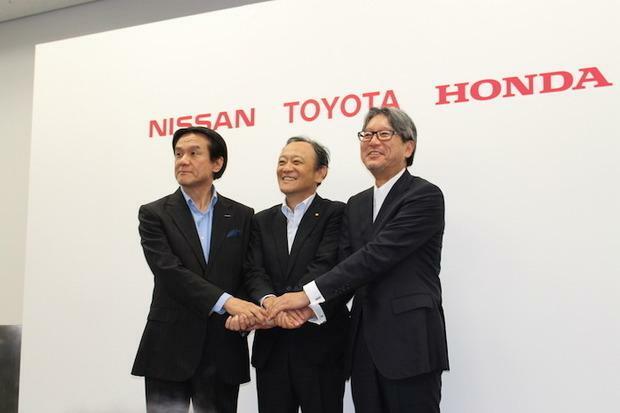 Hitoshi Kawaguchi, senior vice president of Nissan, said the companies will continue to compete on products, but they must come together on supporting hydrogen fueling stations and other needed infrastructure. The three automakers have also agreed "to help infrastructure companies deliver the best possible customer service and create a convenient, hassle-free refueling network for owners" of FCVs. Conducted in conjunction with the Japanese government's support for hydrogen stations, the joint project aims to encourage new companies to enter the hydrogen supply business. Financial assistance will be by the carmakers through the Research Association of Hydrogen Supply/Utilization Technology (HySUT), which is setting up a project to stimulate demand for FCVs. Korean automaker Hyundai this week also announced it plans to focus more attention on eco-friendly vehicles. "Hyundai Motor will strengthen its competitiveness in overall eco-friendly car lineups, including fuel cell, hybrid and electric vehicles, so as to emerge as an industry leader in the business," Euisun Chung, vice chairman of Hyundai, said at the Detroit Motor Show earlier this year. Japan's big three automakers hope to popularize FCVs by creating a reliable hydrogen fueling environment and "ensuring peace of mind for FCV owners." The companies plan to use determine customer needs and hydrogen station operating rates as a way to improve customer service. They also want to bolster the convenience of hydrogen stations by increasing the number of days they are open, extending their business hours, enhancing and providing operational information and developing hydrogen station infrastructure that is easy to access.